Dinner at our house almost always consists of some form of protein, a carb side, and a veggie side. The veggie is usually something hot, like a roasted or grilled vegetable, or some other cooked vegetable dish. 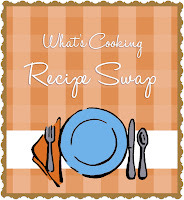 Last night I served something different alongside Jon's meatloaf and scalloped potatoes - a cold, chopped veggie salad. 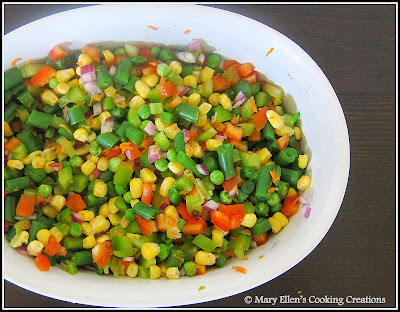 I was given the recipe for Nonnie's Chopped Veggie Salad from the blog Life and Kitchen in this round of the Taste of Home Cooking Recipe Swap focused on salads. It has a lot of fresh, chopped veggies and a very simple dressing. I love chopping veggies - to me it's therapeutic. Nice quiet time (well, as long as the little one is napping or interesting in something besides me!) with just the "crunch, slide" rocking sound of the knife sliding along the cutting board and time for my mind to wander. Ah, I love having time in the kitchen. Ok, back to the recipe. I have to admit, as I was making the dressing I was a little skeptical. It seemed almost too simple! But yea, it totally works. This salad was awesome, especially after it had some time to sit in the fridge once I dressed it. I'm glad Lindsay's Nonnie passed this recipe along to her! Thanks for sharing, Lindsay and Nonnie! Combine all of the ingredients of the dressing and bring to a boil. The recipe didn't specify how long to boil, so I let it boil for a few minutes. Let cool. Combine all of the vegetables (which vegetables you choose can be adapted based on what you like) and pour the dressing over. Mix well and chill for 24 hours (I chilled it for 3 hours and it was really good. I ate it again the next day and it was still really good!). Drain the excess liquid before serving.